Considered Boston's Theatre District's Little Princess, the 1600 seat-Shubert Theatre has a rich cultural and artistic history dating back to the beginning of the 20th century. The Theatre was originally conceived as The Lyric Theatre in the early 1900s by developer Charles H. Bond. Mr. Bond's sudden death resulted in the project's abandonment until New York City's Shubert Organization stepped in and purchased the property in the spring of 1908. Two years later, the newly christened Shubert Theatre opened on January 24, 1910 with performances by America's then most popular actors, E.H. Sothern and Julia Marlowe, in Shakespeare's The Taming of the Shrew. Boston was abuzz with excitement over the opening of its newest Theatre, designed by noted Boston architect Thomas M. James. The new Theatre featured an ornate marble entryway, Florentine doors, ionic pillars, gold ornamental relief work in the spirit of the French Renaissance and a chandelier copied from those in the Petit Trianon at Versailles. A 1925 widening of Tremont Street resulted in the loss of the Theatre's magnificent facade and a shortening of its front lobby. Despite such cosmetic changes, The Shubert Theatre's intimate interior continued to make it perfect for pre-Broadway tryouts. Throughout the following four decades, such classics as The King and I, South Pacific, Camelot and Mame played at the Theatre prior to their Broadway debuts. Many renowned stage actors, including Al Jolson, Sir Laurence Olivier, Sir John Gielgud, John Barrymore, Richard Burton, Mary Martin and Julie Andrews have graced the stage since its grand opening. 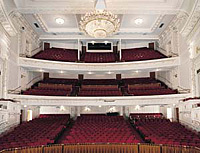 More recently, The Shubert has hosted such Broadway sensations as Cats, Dreamgirls, Les Misarables, Carousel and Rent. The renovated Shubert Theatre was unveiled on October 10, 1996. Since then, The Shubert Theatre has evolved into a home for Boston arts organizations such as Boston Lyric Opera and World Music, as well as a venue for touring companies whose productions are more suited to the smaller scale of the theatre.